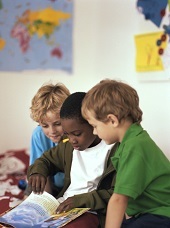 Wouldn’t it be great if your child could write a book of his or her own? Writing is a skill that definitely should be encouraged, and that has many benefits for children throughout their lifetime, including benefits not related to school. Most parents want their children to be able to read well and enjoy reading, too. If a child doesn’t enjoy spending time with books, he or she is unlikely to devote the time it takes to learn to read well. An ideal way to help foster a love for books in your child is to create a literary-rich environment in your home. This can be partly achieved by providing plenty of books and reading materials, displaying a positive attitude toward reading and writing, encouraging reading and writing for both pleasure and practical reasons, and reading aloud to your child every day at the same place and time. When a child first learns to read, it’s helpful to give him or her plenty of opportunities to practice with you, such as by sounding out the words on the back of a cereal box, reading road signs or voicing recipe instructions while making dinner or baking a cake. To help make reading fun for your child, a good idea is to create games that help bolster the reading skills you’re trying to reinforce. 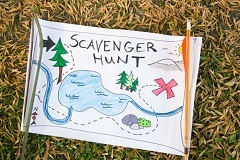 One great game is the scavenger hunt because it can strengthen reading, problem solving, creativity and imagination, among other qualities. 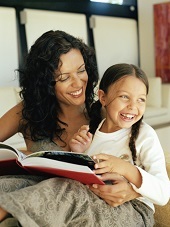 When a child first begins to read, the event can be rewarding and exciting for the parent. However, it can also be stressful if the child finds reading difficult or doesn’t show much interest in the book’s subject. One solution to this problem involves music. 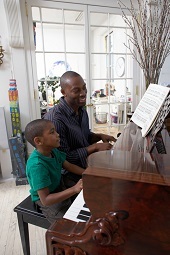 According to research at Northwestern University in Chicago, musical training can help improve a child’s reading ability. The team at Northwestern, led by Nina Kraus, a professor of Neurobiology and Physiology, found some interesting insights concerning the link between music and reading. Editor’s Note: During March, which is National Reading Month, the Gerber Life Blog will carry various posts on that subject, to help parents encourage their children to develop a lifelong love of reading and books. Reading strengthens children’s communication and logical-thinking skills, so look for posts on such topics as building a home reading loft, planning a “reading” scavenger hunt, and publishing your child’s first book. Happy reading, everyone! How can a parent raise a child who will have a lifelong passion for books, learning and knowledge, even in today’s high-tech world? Children are naturally curious and inquisitive. The following tips can help you to develop those innate qualities and get your child on the path to reading and loving books for a lifetime.